Buy TRESemme Nourish & Replenish Shampoo 580ml & Conditioner 190ml Combo Pack + Philips Hair Dryer at only Rs 797 i.e. 50% discount. It is all that your hair need. With just the hair dryer being of Rs 800, it’s like getting shampoo and conditioner for free. So, order now before the product goes out of stock. 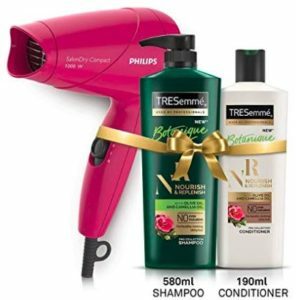 How to buy TRESemme Nourish & Replenish Shampoo 580ml & Conditioner 190ml Combo Pack + Philips Hair Dryer at only Rs 797? STEAL DEAL!!! Buy Philips DuraPower BT3211/15 Corded & Cordless Trimmer at only Rs 649 i.e. 62% discount only on Flipkart. Because of its Durapower technology, it lasts much longer as compared to other trimmers. Also, it’s a corded-cordless trimmer i.e. even if the trimmer isn’t charged, you can plug it in and use it directly. At this price, this product is a must buy. So, don’t miss it. Buy now. How to Buy Philips DuraPower BT3211/15 Corded & Cordless Trimmer at only Rs 649? Save electricity..Save environment. Now at a really affordable price. Buy Philips 17-Watt LED Bulb (Pack of 2, Cool Day Light) at only Rs 320 i.e. 68% discount. Order now before the product goes out of stock. 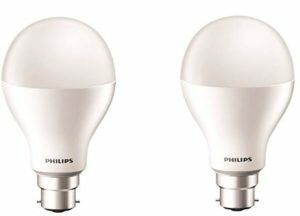 How to Buy Philips 17-Watt LED Bulb (Pack of 2, Cool Day Light) at only Rs 320? It’s what your heart desire. Skin friendly trimmer to give your beard a look that you want with ease that too with your trusted brand at a really reasonable price. Buy Philips Beard Trimmer Cordless for Men QT4001/15 at only Rs 999 i.e. 27% discount. 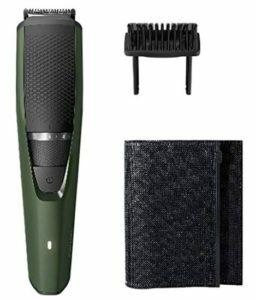 How to Buy Philips Beard Trimmer Cordless for Men QT4001/15 at only Rs 999?